The KG INTERNATIONAL SCHOOL nurtures and nourishes young minds preparing them for a life fit for higher learning amidst the ethos of value based education. The faculty of KGINS is drawn from the best available pool of talent. We take immense pride that their qualifications and experience are diverse but their commitment is singular. Education at KGINS is a highly interactive, two-way process in which the teachers and the taught are on the journey of an insatiable intellectual exploration of the world around them. Our educational tools are designed to help students think out of the box, learn through application, be practical and adopt holistic approaches when confronted with life's puzzles. Teachers encourage the students to discuss everything freely, guide them at every step, mould their impressionable minds to look for beauty in everything, and step out into the world as all-rounders, with confidence in every step. With classroom strength not exceeding 30 students, teachers are able to devote adequate and personalized attention to every student at the school. 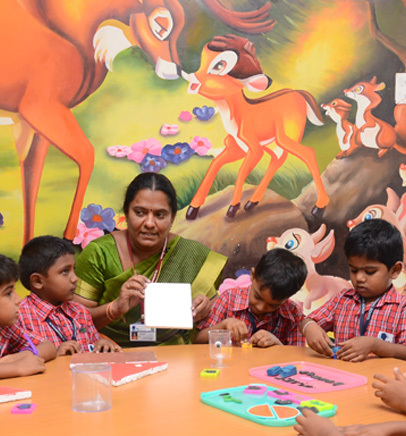 At KG INTERNATIONAL SCHOOL, the teacher-student relationship is not restricted to the classroom alone and children are encouraged to freely consult teachers on any matter.